For a couple of years, 38 yr old, medically retired Marine, Casey Carter, believed his military injury had made him impotent. Having lost his wife to cancer, he hadn’t exactly been worried about the problem. Most days walking with cane was enough challenge for him. But now that he was ready to move on with his life, he had become more worried when none of the females his cousin brought around held any interest for him. So the last woman in the world he expected to start his engine revving again was the mother of his cousin's girlfriend. Even at fifty, Alexa is drop-dead gorgeous, and his libido certainly keeps reminding him she is the first woman he has wanted in a long, long time. Ironically, the more Casey gets to know and like Alexa, he finds out desiring the older woman is the easiest part. Jaded and cynical about love, Alexa is a difficult woman to convince of anything, but her kisses are all the proof he needs that they belong together. The former Marine decides his next mission is figuring out how to fit himself into her life. I really, really wanted to like Dating A Cougar. Unfortunately about 9% of the way in I was ready to give up, but I do love the concept of the story. So I forced myself to ignore the bad characters and the bad editing, and keep reading. I thought, mistakenly, it would get better. The only other thing, besides the already stated concept part, that I somewhat liked, was the flashes of intelligence that Alexa showed. Even though she was shallow, melodramatic, superficial, vain and self-absorbed… I still enjoyed reading about her because of the intelligence. Which made her actions and thoughts, whether I agreed with them or not, believable. 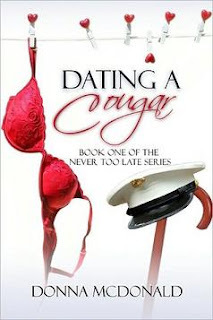 I really wanted to like Dating A Cougar, but when I realized I was starting to get royally miffed while reading it, I knew it was time to walk away. If it had been a short story or novella, I would have continued on, but as a full-length I just didn't have the patience. And I doubt I will check out the other books in the series.